Utahredrock: Sundance Film Festival 2011 Review: "The Ledge"
A stray comment from a man in line at this year's Sundance Film Festival got me interested in "The Ledge," written and directed by Matthew Chapman. I attended a screening last night. Chapman crafted a thriller around two men: Joe (Patrick Wilson), a Christian fundamentalist and Gavin (Charlie Hunnam) an atheist. They are connected by Shana (Liv Tyler), Joe's wife who also becomes Gavin's lover. The film opens with Gavin walking out onto a ledge at the top of a high building. A cop (Terrence Howard) is already having one of the worst days of his life when he's called to talk Gavin down. The story unfolds with a conversation you wouldn't expect between a potential jumper and a cop. A series of flashbacks fill in the back story, building to an unforgettable conclusion. Working with big themes (life, death, faith, religion, trust, love, betrayal, loss) Chapman explores many aspects of being human. He deftly works with these heavy topics in a film that delivers a strong emotional punch while somehow not being a downer--though it is intense. The characters are complex and real. The acting exquisite. "The Ledge" works artistically, emotionally and intellectually. For me, it was one of those rare films that struck many deep emotional chords leaving me feeling raw. Life is not easy, but it's good to be alive, even when it hurts. Great work Mr. Chapman and company! 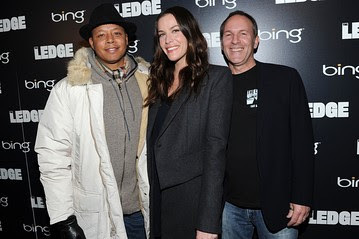 Photo: Terrence Howard, Liv Tyler and Matthew Chapman.